Giving Irish wedding gifts, as with so many wedding customs in Ireland, is steeped in magical folklore and old-fashioned Irish superstition. Deciding what gift to give your friends on their big day will be easier once you learn about a few of Ireland's traditional wedding gifts and what they signify. Giving a bell is thought to ward off the evil spirits that may be lurking to trip up the newlyweds. So, giving this gift is generally associated with helping to preserve harmony in the newlyweds' lives . This traditional Irish wedding gift is also known as a "make-up" bell. The "make-up" or "wedding" bell is supposed to ensure the Bride and Groom stay ever-mindful of their wedding vows and the love they shared on their wedding day. So whenever they are in an argument or otherwise upset with each other one of them can ring the bell instead of walking away to help them remember and, hopefully, snap out of their angry mood. Ringing the bell is also a handy, light-hearted way for the couple to tell each other when they are not entirely happy and need to work something out! There is a wonderful Irish wedding custom for the bride to carry a "magic" hanky on her wedding day. After the nuptials, she keeps it in a special place and takes it out again at her firstborn's christening, to dry the baby's face. Since this is an Irish wedding gift that she would use on her wedding day, it is an ideal gift to give the Bride at her Irish wedding shower. A variation of this Irish wedding tradition is for the hanky to be converted into a christening bonnet, then converted back into a hanky for that child's wedding day. So be sure to check with the Bride's mother beforehand to make sure there isn't already a "Magic Hanky" she has been saving to give her daughter. Otherwise, giving this gift could be construed as insensitive to the family heritage. Click here to read more ways the Irish blend wedding and christening traditions. Another old Irish wedding tradition is for the Groom to give his Bride a coin. This custom originated back when the Groom would pay money to the Bride's family to bring them good fortune and joy. According to this Irish wedding custom, the Groom presents his Bride with the coin after they exchange rings, as a symbol of prosperity. A modern interpretation of this custom is for the Bride and Groom to exchange coins after exchanging rings. They say if the coins click against each other during the exchange, the Bride and Groom will be blessed with many children. After the wedding day, the Bride and Groom keep the wedding coins as treasured family heirlooms, then pass them on to their eldest child to exchange on his/her wedding day. To really pay homage to their Irish heritage, try to get the wedding coins engraved with the following words on the front: "Ta alan notai I bport an bhanias", which is Gaelic for "There are many notes in the wedding tune". And the phrase "Gra go deo" engraved on the back, which means "Love Forever". Some Irish wedding coins are manufactured with these phrases already engraved on them. But even if you can't get them engraved with these phrases, they're usually sold with personalized engraving included for the couple's names and their wedding date. The horseshoe has always been associated with good luck in Irish folklore. Brides traditionally carry a horseshoe with them on their wedding day for good luck. After they set up their home together, the horseshoe is hung over their front door to continue to ward off evil and despair. These days, horseshoes sold as Irish wedding gifts are usually made of porcelain and will often have lovely Irish or Celtic designs. Just remember, if you give the couple a horseshoe, give it to them with the "U" facing up - this way it stops the luck from draining out! Salt and Pepper Shakers... so their home will never be without food. 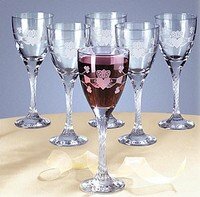 Wine Glasses ... so they will always have plenty to drink. Candlestick Holders ... so their home will always have light. Giving gifts is an important part of the culture of hospitality in Ireland. So if you have been invited to an Irish wedding, it's important to choose your wedding gifts wisely. We hope some of these traditional Irish wedding gifts have given you some ideas.